The World of the Hunger Games! The World of the Hunger Games is pretty rich for a three book (and four movie) series. Lots of characters and places and undiscovered stories. Also, fun merch! Like these adorable Funko Pop! Figures. The Katniss Everdeen one – yeah, I’m trusting the USPS to bring that safely to my house next week. 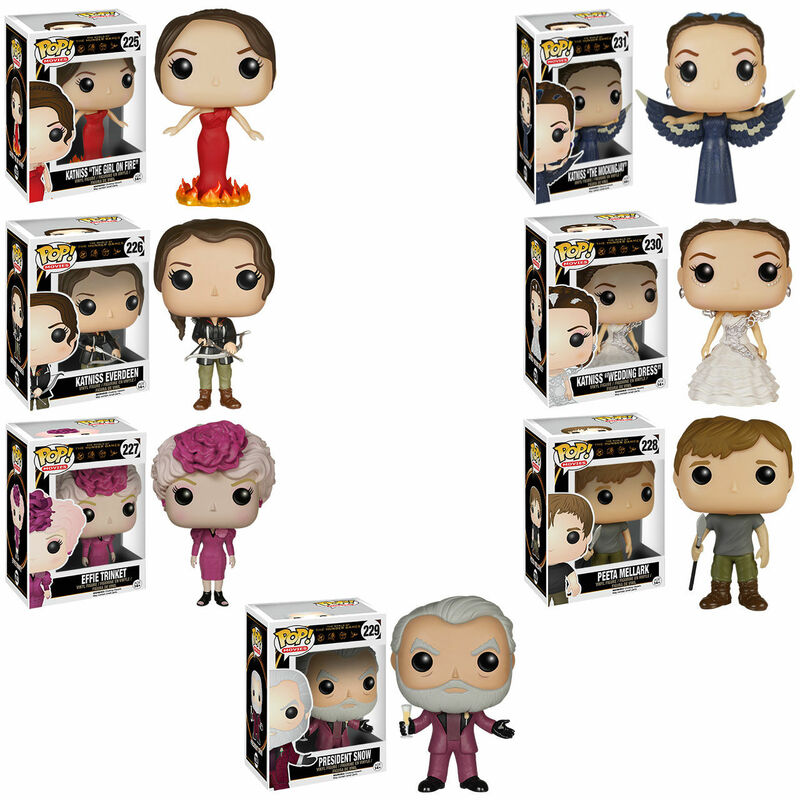 The Peeta one will probably be a necessary purchase at some point as well. Cuteness aside, we’re seeing a continuing theme lately with Hunger Games stuff. Instead of it being branded THE HUNGER GAMES, it’s branded THE WORLD OF THE HUNGER GAMES. Or advertisements for the Hunger Games Exhibition. 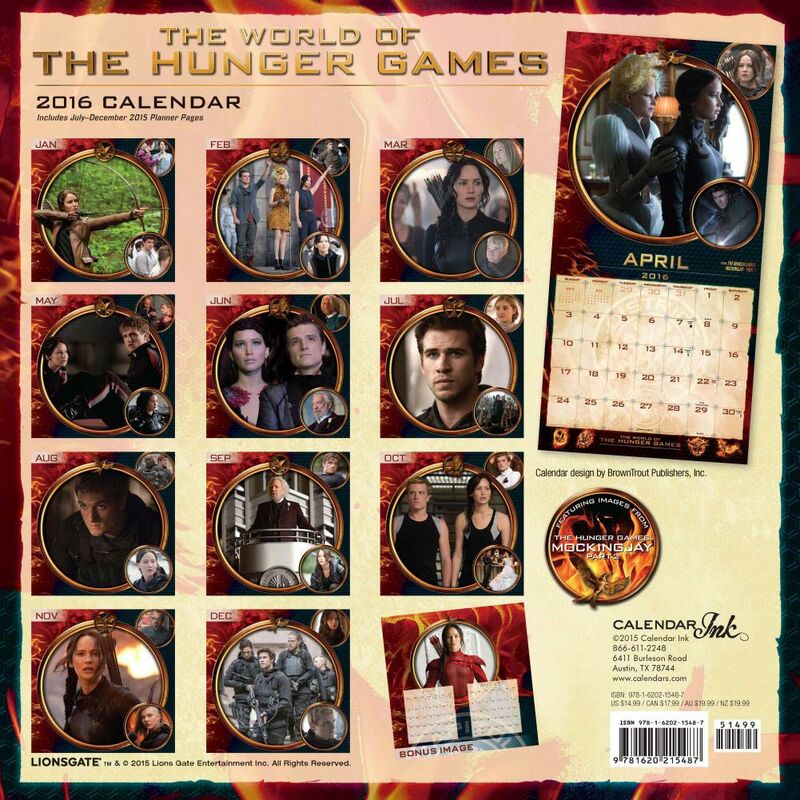 Or the 2016 World of the Hunger Games calendar. No, this wording isn’t just simple coincidence. It’s a deliberate transition of the HUNGER GAMES brand from simply being three books adapted into movies to the development of a larger world that can be mined for years to come. It’s a big (largely profitable) trend in Hollywood, so no surprise that it’s happening here. Next November, (in THG’s relinquished weekend slot) we’ll see the first of the Harry Potter prequels come to screen. It will be interesting to see how this movie does without Harry being the star of the show, just as it will be interesting to see how THE WORLD OF THE HUNGER GAMES transitions from being about Katniss’s journey, to other stories in Panem. When will development of the next Hunger Games movie be announced? Six months? One year? Two? Place your bets now. I NEED Funko-Effie to pair with Barbie-Effie. x3 (Would that there were a Haymitch!!) And I do believe that very calendar shall be the lucky one to grace my bedroom wall next year. I have also noticed the sudden emergence of this “World of” terminology–clearly a conscious, strategic, and deliberate choice. And one that I excitedly, wholeheartedly welcome, because there’s nothing I’d love more than a deeper exploration of this world. I could aaaabsolutely see a future episodic series further exploring the minutia of the story…or the events leading up to and following it, focusing on people outside of Katniss and simply expanding on what we’ve got…it could definitely take a TV show format (Game of Thrones-level, of course; nothing less!) I can also see the world being expanded via graphic novels, short stories or films, or just more standard books. Well, since the only comment so far is very enthusiastic about the idea of the Hunger Games being turned into a “franchise” and not just books and movies — I am personally not quite as enthused. The standard merchandising with figurines, posters, calendars, I am fine with. However, unlike JKR or GRRM, who have undertaken many such “spinoff” projects on their own in terms of “in-universe” books and short stories set in their worlds, or even SM with her Bree Tanner novella and Guide to the Twilight series, it really doesn’t seem SC herself is that interested in expanding the world much more than she already has. JKR seems to be quite involved in the Fantastic Beasts movie and that’s fine. But the movie so far seems to be a straightforward adventure story aimed at a younger audience — perhaps an audience so young that the FB movie will actually *introduce* them to HP. As opposed to being aimed at “veteran” fans who essentially grew up along with Harry, but have indeed “grown up”, much as Daniel Radcliffe certainly has. But while, Haymitch’s Games, or the Games won by Finnick, Annie, Johanna, Beetee, etc., have been mentioned as possible prequel fodder, I don’t think their stories are appropriate to be turned into simple adventure tales. The movies so far have managed to balance the “entertainment” factor and a more serious understanding of the underlying injustices behind the Games. Simply showing someone “winning” their Games, as if that is a happy ending, wouldn’t really be in keeping with the messages SC is sending. Note that in both THG and CF, the Games do NOT end exactly the way the Capitol would have preferred. And while Haymitch’s Games does have a twist ending that comes close, I’m not as sure about the other Victors. As for GOT…as I’ve stated before, I’m really disillusioned with that franchise, and would NOT take that franchise as a model for THG going forward. Please, no. It’s not just that the TV series has completely gone off the track in S5 and reduced characters and storylines to tired old tropes that GRRM has tried to deconstruct in the books themselves. It’s that it really seems the “derivative” works have actually completely overtaken the original work in importance to the franchise. This is somewhat GRRMs fault as well for selling the rights BEFORE he’d finished the story. He seems to be way too involved in selling “the WORLD of ASOAIF” than in the actual story now. A lot of “spinoff” material has been produced by GRRM himself, including novellas set in Westeros decades or centuries before the GOT events, producing an app and book guide actually titled “The World of Ice and Fire”; there’s even a “Wit and Wisdom of Tyrion Lannister” that is just a collection of quotes from Tyrion. Nice for Tyrion fans to have, but doesn’t add anything important really. It’s gotten to the point that many original ASOIAF fans feel pushed to the side, resigned to finding out the end of the story from the show BEFORE the books, and that’s a best-case scenario, many fear GRRM won’t get around to finishing the books at all in his lifetime. Again, I think many of the problems can be traced to GRRM’s decision to sell the rights before the story was complete. This is not the case for SC, thankfully. So hopefully the worst will not happen. I can understand the reservations. True, Suzanne’s been quiet aside from providing the filmmakers her input. And no one would want to see anybody else hijack this story and do anything under its name without her involvement and full approval. We’ll have to see what happens after MJ2 has been out a while and had time to really sink into people. The Fantastic Beasts movie may be “Harry Potter-related” rather than an actual prequel/sequel, but I’m hoping it’ll be a good start, at any rate. As someone who enjoyed reading that book and the Quidditch one, I expect to enjoy it even if it is aimed at younger viewers. On the other hand, that stage play set to run in London about Harry & his son Albus? That’s got me baffled. How can you presume to sequelize HARRY ****ING POTTER in the form of a PLAY? I love theatre as much as the next thespian, but come on! Not a book, not a film, but a play? Really? Please let it just be a temporary test of sorts, to gauge the audience’s response. Or at least let the recording & script be made available worldwide.